Resistors are Riedon's specialty. Please consider our staff as your additional engineering resource. Some applications demand special resistor designs. Many firms have turned to Riedon for resistors that were innovative answers to difficult problems. For example, we make sensing resistors for temperature compensating, flow instrument elements, and many other custom products. 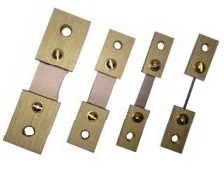 We also provide modifications to our catalog products, such as matched sets and resistors with custom-formed leads. Please take advantage of these problem solving skills. Riedon maintains an extensive database of resistors available from other suppliers. Call us with their part number; we will identify the Riedon equivalent, and give you a price and delivery proposal. Call today +1 (626) 284-9901; (M-F, 6am-5pm PST) and have your samples within 7 days. Contact Us for samples. For more than 45 years, since our formation in 1960 Riedon has been at the cutting edge of resistive solutions; this is evident today in that our Wirewound, Thick & Thin Film, and also Foil resistive products can be seen in industries as diverse as: Aerospace, Military and Instrumentation. Our installed customer base varies from the largest Fortune 100 conglomerates, global contract manufacturers, to the smallest of independent companies. Today Riedon employs more than 130 team members worldwide and has manufacturing, technical support, and sales facilities in the U.S., Europe, Asia, and Mexico. Inherent to our diverse customer base are their individual and disparate needs - Riedon has created its business ethos around serving these customers efficiently and effectively regardless of their requirements. Today Riedon is dedicated to offering the best customer service and support within the resistor industry; consequently we utilize a direct to end-user methodology to ensure that our customer's needs are met effectively and efficiently. Immediate personalized technical support and problem solving. Flexible manufacturing systems enable us to support orders of just 100 resistors through to 1million pieces with the same support and enthusiasm. Custom application support and design, utilizing our global engineering and technical resources. A dedicated sales manager and customer service representative to guide you through, and support your ongoing resistive needs. Online quote and sample order requests. Global part tracking through our CRM solution to ensure product traceability. At all of our global locations, quality, performance, and traceability are closed loop processes. It begins with product design, constant improvements through critical analysis of customer and manufacturing data. In process testing (to both Military and IEC specifications), visual inspections and 100% final acceptance testing of DC resistance ensure our resistors perform to the standards our customer's requirements.